What Is Special Price In Magento? Automatically updated "Shop By Special Price" page can be created using the extension. The page can show products with special prices for all the store or for specified category. Product list for the page will be updated automatically, depending on configured catalog price rules and/or product settings. 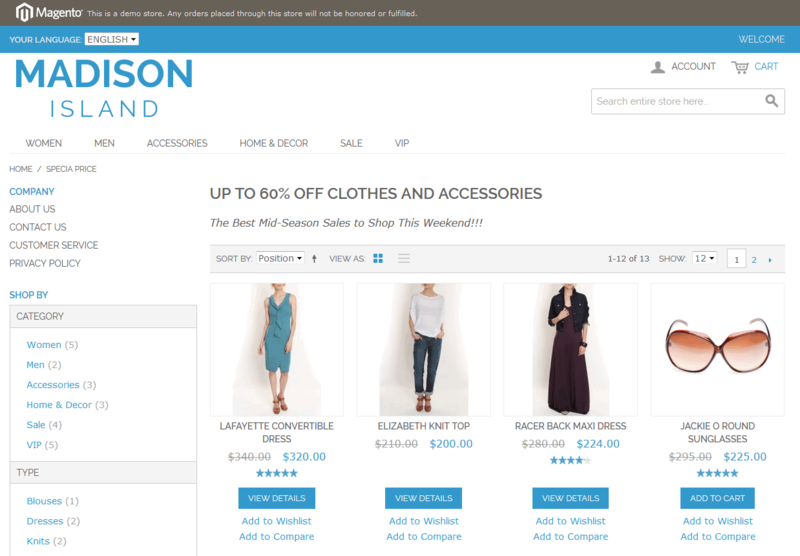 "Shop By Special Price" page can be created either original Magento Layered Navigation or SEO Layered Navigation Plus extension by MANAdev is used. Each or both special price methods can be used in "Shop By Special Price" page. Create a CMS page on which you will place a list of products with special prices. To do it go to menu CMS-> Pages and press Add New Page in Magento Admin Panel. Fill in the fields as usual, specifying page title, URL key and content. Read Important Notes and do modifications if you need. Read How To Show Products With Special Prices Only, Ignore Catalog Price Rules and do modifications if you need. Read How To Ignore Products With Special Prices, Show Only Products Affected By Catalog Price Rules and do modifications if you need. 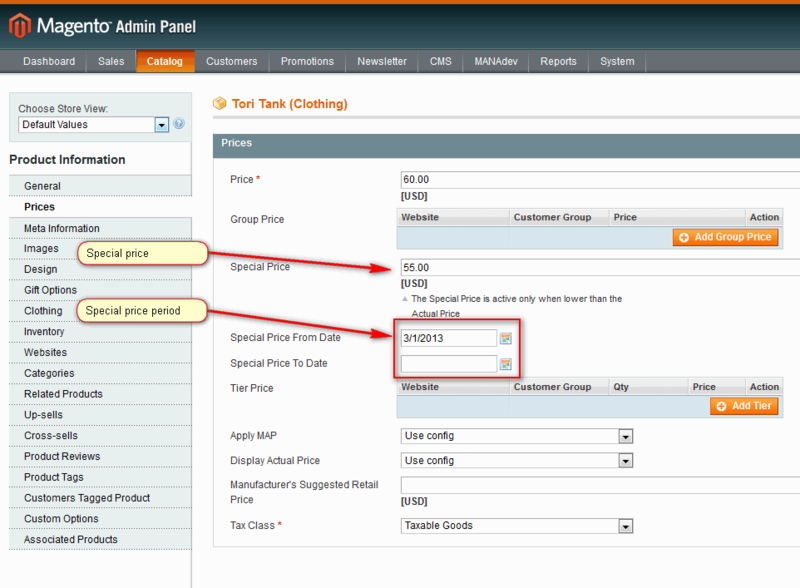 Read How To Create Special Price For Custom Attribute Page and do modifications if you need. All XML instructions above add product list to content area of the page, layered navigation block to left column and remove all products with regular price from the list, so you get a list of products with assigned special price and products affected by catalog price rules. Also insert ID of root category in <category_id>3</category_id>(3 times). Check How To Find Category ID in order to define root category ID of your store. Open root category or other needed category of your store through Catalog->Manage Categories. Make sure that Is Anchor=Yes on Display Settings tab (only needed if you want layered navigation to work). If "Shop By Special Price" page should contain products with special prices for all the store it is necessary to find root category ID before configuration. It can be done in two steps. In case the page should show product for any other category, you need to perform only second step. First, find store root category name. Here you can find instruction how to do it. Second step is to define ID of root or other category. Here you can find instruction how to do it. By default created CMS page shows both products with assigned special price and products affected by catalog price rules. You can disable either of these conditions. If SEO Layered Navigation Plus extension by MANAdev is used you can also easily apply special price filter and custom attribute filter on one page. Below is an example of "Special Price Red" products page layout. Please note that instead of one block named "product_filter"
It will work either original Magento Layered Navigation or or SEO Layered Navigation Plus extension by MANAdev is used.